There’s no better way to welcome warmer weather than with nature’s candy – the strawberry. Enjoy them on their own, in pastries, or added as a sweet surprise in a light salad. 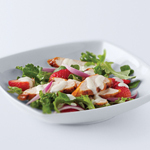 Try strawberries with Kraft Salad Dressings, made with real ingredients to punch-up the flavor of your favorite fresh fruits and veggies!